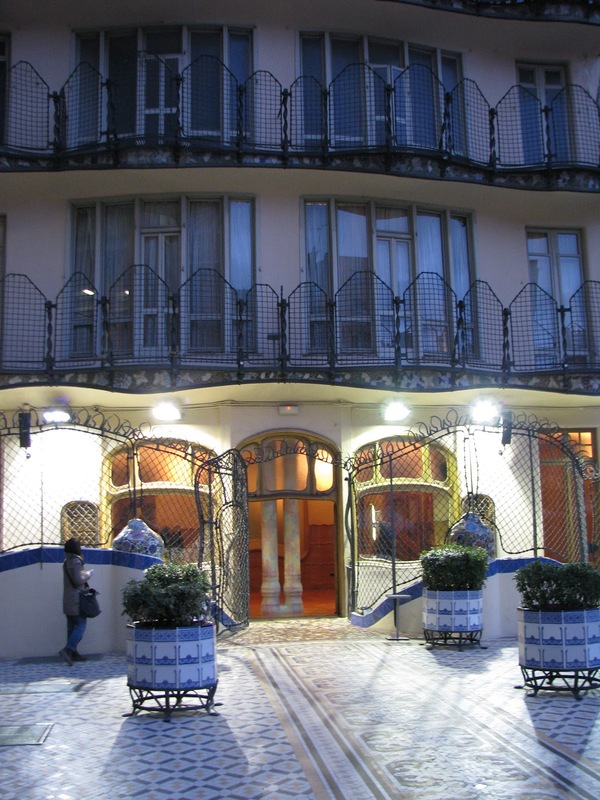 This is Casa Battlo, which Gaudi and his friend, Josep Bayo i Font, were commissioned to renovate in 1904. It is located a few blocks down from where I live on what was then a major artery of the city, Passeig de Gracia. It's one of three trippy houses on this block giving the block the name of "Manzana de la Discordia," or Apple (Block) of Discord. All three houses were renovated between 1898 and 1906, the period when most leading modernist Catalan architects constructed buildings. According to Greek mythology, the Apple of Discord was tossed from Mount Olympus by Eris (Discord) to be given to the most beautiful goddess, which sparked jealousies and caused the Trojan War. 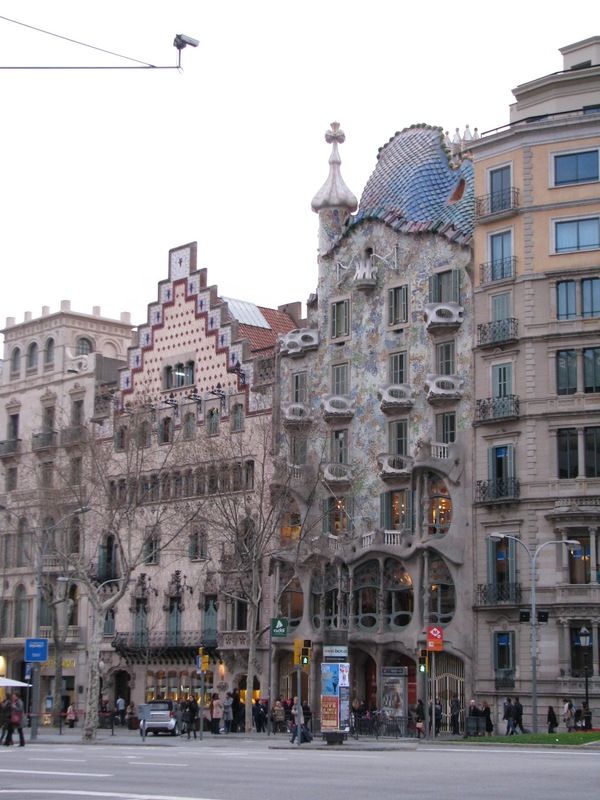 Although Casa Battlo didn't spark the Trojan War, it did serve as a refugee center during the Spanish Civil War, specifically 1936-1939. Before that time period, the Battlo family lived in the main apartment, and during our tour, we were able to see the crazy world of undulations and color they enjoyed! 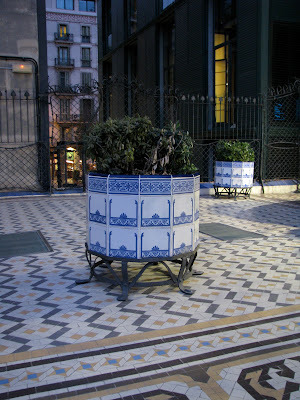 In the entrance hall, there is a dark ceramic fireplace between two benches. 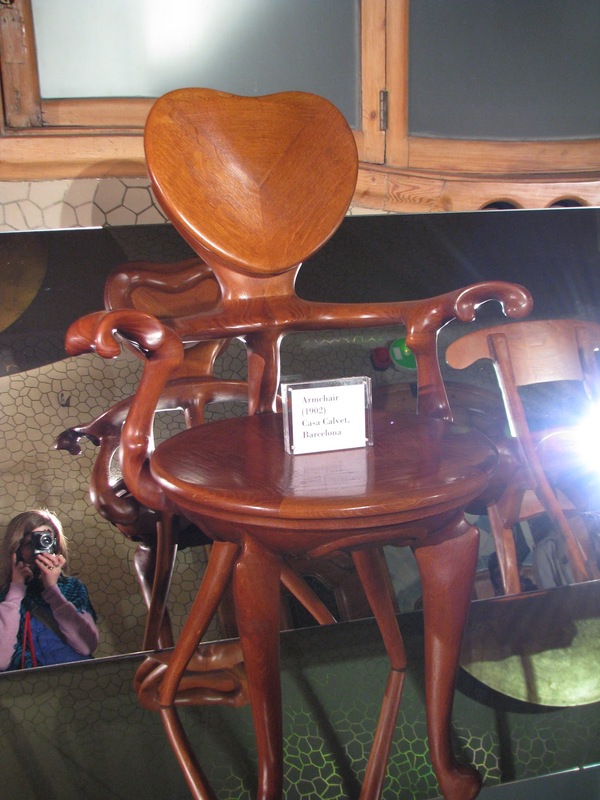 One is for two people and the other bench facing it is for one; supposedly, the larger bench was for a couple, and the smaller one for the chaperone. Everything swirls. Gaudi didn't believe in straight lines, as none exist in nature. To soften the light streaming in, the internal light wells shine with blue tiles. 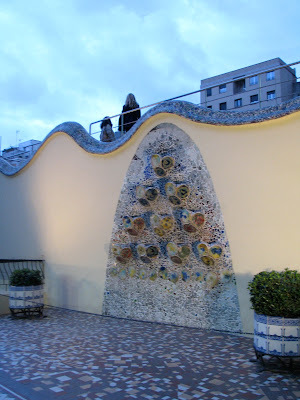 Gaudi thought of everything: the tiles were a lighter color at the bottom where less light reaches and a darker blue at the top, giving the whole light well a uniform look. Throughout the building, there are fixed apertures providing natural ventilation. The air is forced to rise as in a normal fireplace chimney, but the chimneys on the rooftop are not normal-looking, by any means! 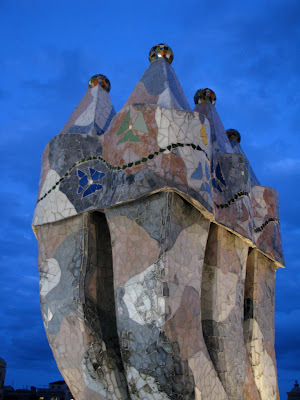 We toured the house just before closing, and were lucky enough to hit the rooftop just as the city moved from dusk to night, the sky a beautiful blue--purple like Gaudi's tiles. The crest on the rooftop is reminiscent of a dragon's back. 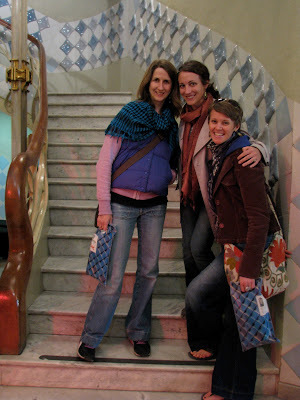 "According to popular tradition, Sant Jordi was a Roman soldier and was born in the 3rd century in Capadocia in Turkey. This Saint, who was under the orders of the emperor Diocletian, refused to carry out the emperor's edict to persecute all Christians and for this reason he was martyred and decapitated by his companions. In the eastern part of the Roman Empire, he soon became venerated as a martyr and shortly after this, fantastic stories related to him began to appear. The most popular legend in Catalonia about Sant Jordi tells that at Montblanc, in Conca de Barberà, there was a terrible dragon which viciously attacked men and beasts. To pacify it, lots were drawn and a person was chosen to be given as a sacrifice to the monster. One day, the misfortune fell on the king's daughter, who would have died in the beast's claws if it had not been for the arrival of a handsome knight who challenged the dragon and killed it." 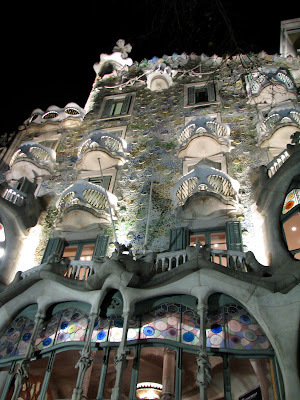 The attic of Casa Battlo resembled ribs and were colored like bones, matching the outside bony structure of the house. Walking down the stairwell, at each landing there were wavy glass banisters which when looked through, resembled being underwater. At the top of the facade (hard to see from this picture), Gaudi created a turret bearing the acronyms in enameled ceramic of the names of the Holy Family: Joseph, Mary, and Jesus.